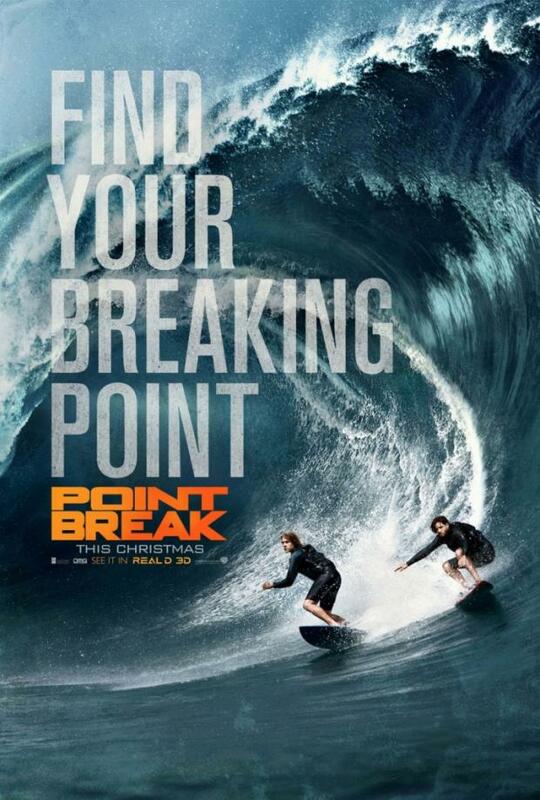 A young FBI agent (Luke Bracey) infiltrates an extraordinary team of extreme sports athletes he suspects of masterminding a string of unprecedented, sophisticated corporate heists. Woah. This was bad. I don’t know why I expected anything else. A needless remake of an iconic action thriller that did nothing to justify its production. Now credit where’s it due. The opening was actually quite watchable and zipped along. A silly introduction made full use of the gimmicky 3D. Something I haven’t been able to say for the majority of these heavily flogged features. Bracey’s Utah blazing sand and gravel from his dirt bike straight out at the screen. It was a little corny BUT it set up Utah’s thirst for adrenaline. A necessary skill set. Apparently. A botched stunt soon sets him on the straight and narrow. And we flash forward to the present with Utah now enlisted in the FBI. Woah. Bracey (The Best of Me) was perfectly cast as Utah. And for the first 30 minutes, I was actually NOT hating it. He looked like a surfer dude and channeled his inner Keanu. Oh, how wrong I was. Like the great (and dare I say, CGI’d?) waves that Utah and Bodhi surfed, the pace meandered along and had little to offer in plot, action or quotable dialogue. Even the little nods to the original came off half-arsed. Okay, the President faces laminated on the motorbike helmets wasn’t a bad touch. Now the heists were actually quite good. The special effects were brilliant. A fantastic sequence in which the suspected criminal gang of adrenaline junkies unleash millions of dollars from a plane stopped my griping for a moment. The 3D gimmick flickering dollar bills at my face. BUT the problem was that there wasn’t enough of these moments. One good scene does not a good movie make. Ray Winstone’s performance as Pappas was dreadful. It didn’t help that he had to drawl out some cliched and incredibly naff dialogue BUT his character had nothing on Gary Busey. Speaking of drawls; was Winstone supposed to be American? His mish-mash accent didn’t work at all. Just keep it cockney, Ray. Delroy Lindo (Gone In Sixty Seconds) was completely wasted in his role as Instructor Hall. He should have been in it more. His reaction when Utah tries to explain the incredibly hammy plot entertained me more than the rest of the cast. Edgar Ramirez (The Bourne Ultimatum) was always going to struggle to match Patrick Swayze’s charm BUT he didn’t do a bad Bodhi. A charismatic presence in a lifeless piece. His relationship with Utah didn’t have that natural chemistry like the original. It felt rushed and was cliched to death. The macho street brawls, ridiculous ‘hippy’ mantra and cheesy bro-mantic hugging was too much. The pace dragged when the heists weren’t taking place. We had to drudge through droll dialogue, cheesy exchanges and a laughable plot line that went no where. Utah’s romance with Teresa Palmer (Warm Bodies) was completely unnecessary. It added nothing to the mix and the pair didn’t even have the same chemistry as Reeves and Lori Petty (Free Willy). The premise was weak. A group of adrenaline junkies attempting to complete a teaching called the Ozaki 8. Eight ordeals to honour the forces of nature. Yeah, I know right? The whole taking from the rich and giving to the poor spiel was fine BUT it was so obvious that it was Bodhi’s gang doing this and yet our hero couldn’t see it. Even when he was taking part in one of the crimes?! Ericson Core’s cinematography made this like something out of a Michael Bay flick and there were a couple of decent set pieces BUT otherwise, this remake was terrible. Boring, predictable and thoroughly disappointing.